Dr. Danielle J. Alsandor serves as an assistant professor educating current and aspiring student affairs professionals on competencies and skills needed to provide effective services to diverse student populations. She earned her Ph.D. and M.Ed. in Higher Education Administration from The University of Texas at Austin. A proud Louisiana native, Dr. Alsandor completed her undergraduate degree in Mass Communications from the University of Louisiana at Lafayette. Prior to joining UIW, she worked as a faculty member at Louisiana State University and Valdosta State University. 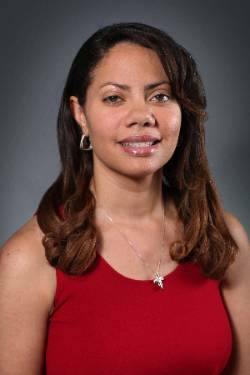 She also worked as a student affairs professional for eight years performing academic enrichment, diversity initiatives and academic advising. Connecting theory to practice is important to her, as she believes effective and professional personnel should be able to identify theoretical underpinnings as they work to address and resolve challenges facing college students and adult learners in higher education in the United States. She is a member of the Association for the Study of Higher Education, the National Association of Student Personnel Administration, Sisters of the Academy, the American Association of Blacks in Higher Education, the Research Association for Minority Professors and the Texas Association of College and University Student Personnel Administrators among others. Spending time with family, friends, and her dog Deeno.